La Turballe is situated on the coast of the Pays-de-la-Loire region, to the west of Guerande in the Loire-Atlantique department. It is a popular coastal resort due to the large sandy beach in the centre of the town. France This Way comment: La Turballe is a much quieter resort than some in the region and will be a destination for visitors whose main interest is spending time on the beach! The coast in La Turballe falls into four parts: a long beach, the pleasure port, the fishing port, and then further north there are some smaller beaches. 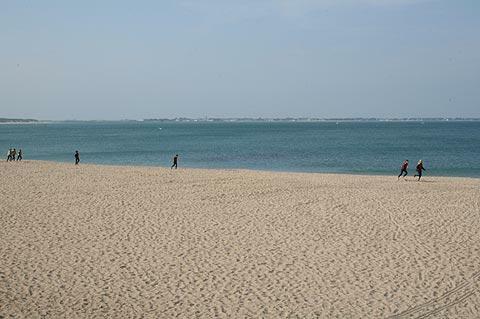 It is of course the beach that is the main attraction for visitors to La Turballe - the beach is long, sandy and children friendly and has received the 'blue flag' award for its quality, cleanliness and facilities. In fact there are several beaches that together continue for several kilometres to the south of the town. When we visited the town the local school children were heading off for their sports lesson of canoeing on the sea - my school never offered that choice! If you continue to explore to the north of the beach there is a harbour full of pleasure boats, then after that you reach the harbour for the active fishing industry - you can take a short tour of a traditional sardine fishing boat in the harbour to learn more of the fishing techniques used. 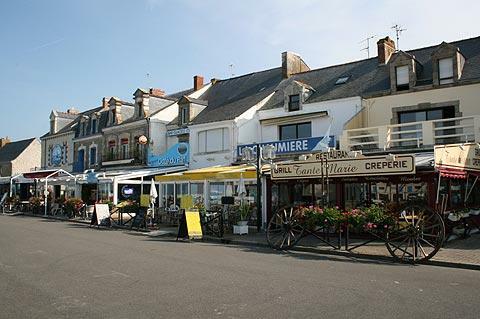 The seafront behind the beach in La Turballe isn't overdeveloped, and the town itself is pleasant if unremarkable, with streets lined with traditional cottages and a small selection of shops and cafes. If the day isn't too hot and you are feeling energetic head for the church - the belltower is open to the public during the summer and has lovely views out to sea from the top, but there are rather a lot of steps to climb! It is also possible to visit a traditional 18th century windmill at La Turballe. 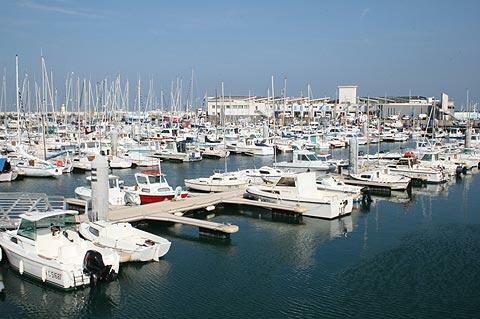 One particular place of note close to La Turballe is the picturesque town at Le Croisic, which is a lively harbour town with lots of seafront restaurants. The coast here is called the Cote d'Amour. A little way inland to the south-east be sure to explore the historical walled town of Guerande, and its charming medieval centre. A boat trip on the quiet marshes and canals in the Briere Natural Regional Park is an enjoyable way to explore the second largest area of marshes in France (the Camargue is the largest). La Turballe is also a departure point for boats to some of the popular islands of the islands to the west off the coast of Morbihan (Brittany) such as Belle-Ile, Hoedic and Houat.